Spring is here and that means so is spring cleaning! It’s something we all know we should do and yet we all might be avoiding it. Well, stop! Spring cleaning is the perfect opportunity to rid your space (both mental and physical) of unwanted items and tasks that have been bogging you down. Plus, we’ve done some of the work for you! 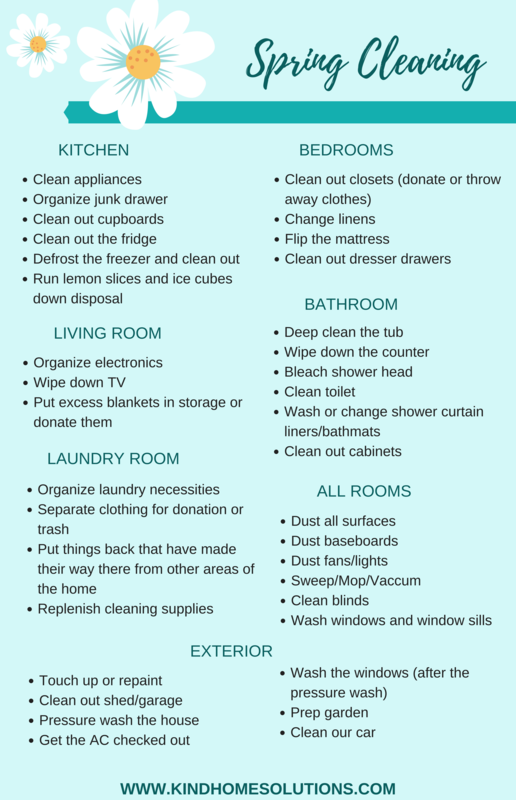 One of the best ways to start your spring cleaning project is to actually take the time to get organized and prepared. We know, “get organized to organize?” Yes! By taking the time to get organized before undertaking a spring cleaning initiative you will avoid beginning a project and not finishing it. Admit it, we’ve all been there! We’ve all had the brilliant idea to pull everything out of our junk drawers and “organize it” only to leave a pile of stuff on the kitchen table. Or worse, you end up just shoving it back in the drawer. Fear not though, we’ve compiled a list of all the things you should check out, sort of an inventory, before beginning your spring cleaning! There is also a bonus spring cleaning checklist at the end of this blog if you’re stumped on which projects you should tackle. Check the exterior of your house. This is going to be a little more straightforward than the interior so it’s a great place to begin. Walk around your home and make note of what maintenance you need to do. Things to pay attention to are cleaning out the garden, painting the house, organizing the shed, etc. Each home is different but take a thorough look around so you can make a complete list. Once you’ve done an inspection, inside and out, you’ll want to prioritize and start checking things off the list. Now, check out the interior. Spring cleaning wouldn’t be spring cleaning if you didn’t tackle some of those interior projects. No, we aren’t talking about doing the laundry (unless it’s been piling up lately)! Do an inspection of the interior of your home for projects that you’ve been putting off. Things like cleaning out closets and junk drawers, painting rooms, getting rid of old furniture, etc. As they say; a clear space is a clear mind. Be ruthless and don’t hold back. If you’re holding on to something that you no longer use it might be time to let it go. That being said “get rid of” doesn’t have to mean throw away. You can do good and feel good by donating things that are in good shape! Consider spring cleaning your workspace. We aren’t just talking about organizing your office. Although, that’s a great place to start. What projects at work have you been putting off? Usually, we’ll avoid “big” projects or tasks that feel overwhelming or dull. This can lead to a ton of added stress. Your brain won’t be able to kick that nagging feeling until the task is done so we challenge you to tackle that task head on! Make a list of everything you need to do. A lot of the time this list is much shorter than we imagine. Make your list and then prioritize. Knocking out the biggest or most daunting project first can really help clear up thinking space. This leads us to a mental spring cleaning. Sometimes the tasks we’ve been avoiding aren’t as tangible. Just like work tasks though, these can give you that constant anxiety. If you’ve been meaning to find a new dentist, organize your budget, or even take that cooking class you’ve been talking about. Now is the time to do it. Spring cleaning isn’t limited to just stuff. Lift the weight off your shoulder and systematically check things off your to do list. Speaking of spring cleaning to do lists, we’ve got one for you! You can steal a few ideas or print out your own. In the very wise words of a friend of ours, “this is about progress, not perfection”. Take your spring cleaning one step at a time. Complete each task before moving on to another. Most importantly, have fun and enjoy your renewed space! This entry was posted in Green Living and tagged ecofriendly, green living, Greener home solutions, spring, spring cleaning.